The National Law Journal's VerdictSearch affiliate scoured the nation's court records in search of 2014's biggest verdicts. 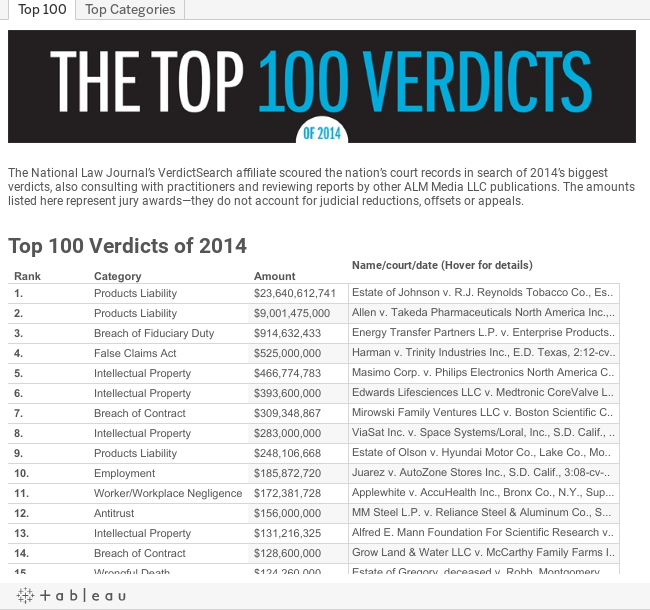 The National Law Journal’s VerdictSearch affiliate scoured the nation’s court records in search of 2014’s biggest verdicts, also consulting with practitioners and reviewing reports by other ALM Media LLC publications. The amounts listed here represent jury awards—they do not account for judicial reductions, offsets or appeals. *The chart has been updated to include John E. Nathan in the list of lead plaintiffs attorneys in case No. 6, Edwards Lifesciences LLC v. Medtronic CoreValve LLC.